US Castings offers cast and finished products using a wide range of production technologies and a full range of alloys. Advanced technologies are employed to adhere to the value-engineering principles of this organization. Our technical expertise, development insight, and production resources, assure accuracy, mechanical strength, corrosion resistance, and excellent appearance at an equally attractive price. US Castings places a high degree of value on the quality of the cast products manufactured. The application of technical expertise, development insight, and production resources assures accuracy, mechanical strength, and any additional mechanical properties as required by the customer. 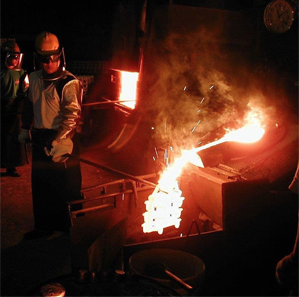 US Castings can melt a wide range of alloys including steel, stainless steel, tool steel, gray & ductile iron, bronze, titanium, and a full array of aerospace and specialty alloys. 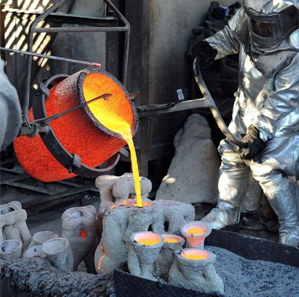 The use of modern, state-of-the-art casting technologies ensures that the entire finished piece is fully cast, minimizing pockets or internal defects, and that the surface is manufactured to each individual customer’s specification. Additional surface finishing services are available including shot blasting, polishing, machining and grinding, maximizing the end customer’s perception of value at a very competitive price. A wide range of alloys of metals including steel, stainless steel, gray and ductile iron, brass, bronze, aluminum, Hastelloy ®, & titanium. Investment, metal-mold, sand, die casting, and lost foam processes. Complex geometries such as engine heads, exhaust manifolds, etc. In keeping with US Castings’ core philosophy of Value Engineering, the design and development team understands that in the end, customers are looking for a cast or forged product that meets their specifications and is competitively priced. US Castings engineering department is available to consult on geometric complexity, surface finish, cost and other factors. US Castings expertise in Value-Engineering will help to achieve the desired result at the lowest possible unit or overall cost.